You may wish to read an introduction to this section or a page on Roman and Medieval Cividale first. The oldest records mentioning the Town Hall are dated 1286. The building was abandoned for many years until the Venetians restored and modified it in 1545-88. 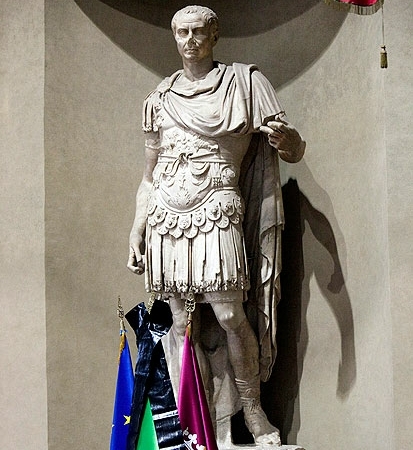 In particular they added a large external staircase which was demolished in 1934 when the Town Hall was given a very medieval appearance and a modern bronze statue of Julius Caesar, the founder of Cividale, was placed near its entrance. 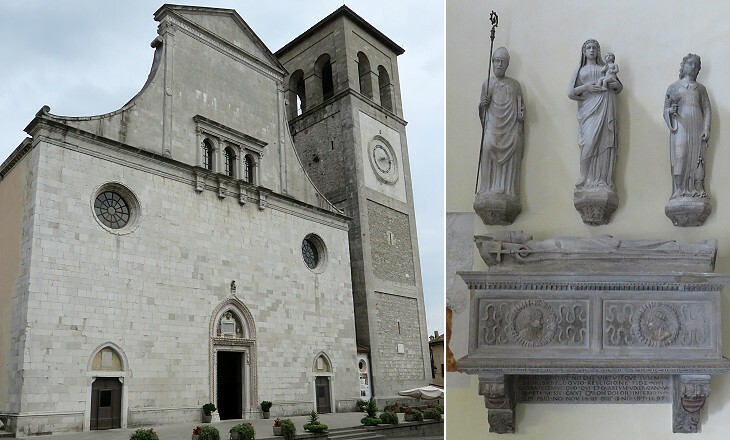 The building is a very small one, when compared with those erected in other Italian towns, but the Patriarchs of Aquileia, to whom Cividale belonged until 1419, did not allow its citizens much freedom to develop their self-government institutions. The Patriarchs built a large church on the site of a previous one of the VIIIth century, but an earthquake caused major damage to it. The current church is dated second half of the XVth century, but the upper part of its façade was built by Pietro Lombardo, a Venetian sculptor and architect (you may wish to see a funerary monument he designed for Loukas Spandounis at Agios Dimitros in Thessalonica). 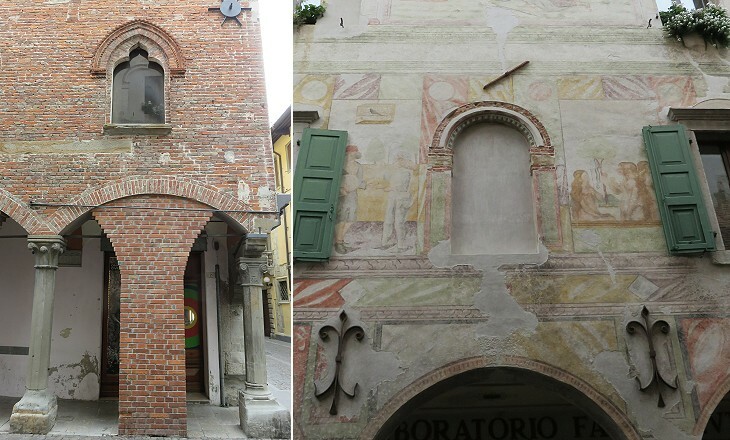 The lower part of the façade was designed by Bartolomeo delle Cisterne and it was embellished with three portals, one of which was very finely decorated by a Venetian sculptor, known only as Jacopo da Venezia. 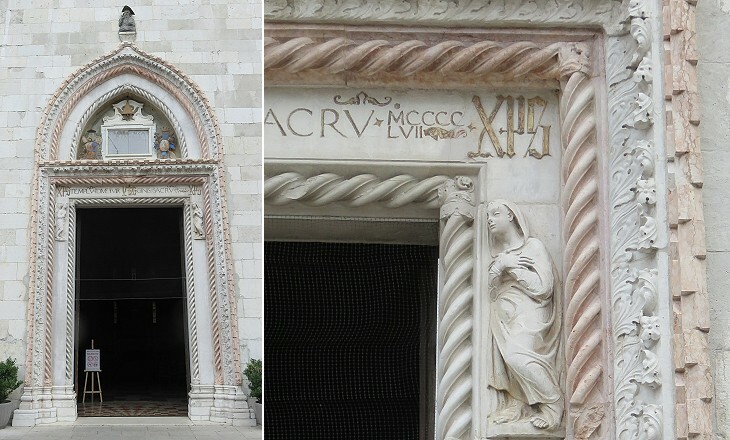 The use of white and pink marbles for the decoration of portals can be noticed in many towns of Umbria such as Assisi and Spello. Venice was involved in a series of war between 1508 and 1516 at the end of which the Republic had to surrender some territories to the Austrian Archdukes. 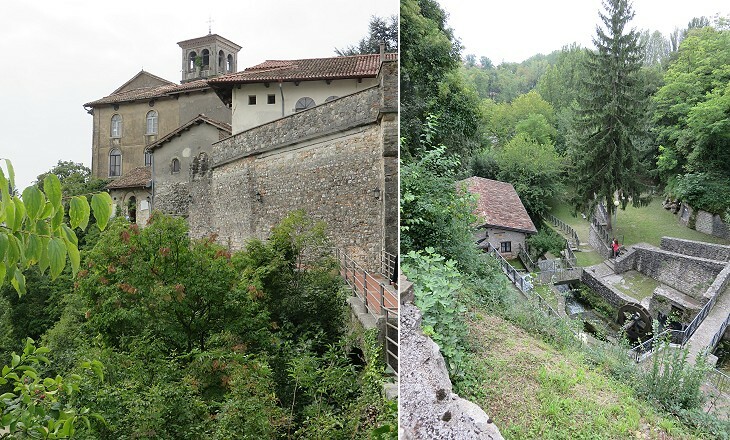 These included a valley north of Cividale and the economy of the town suffered from this loss. 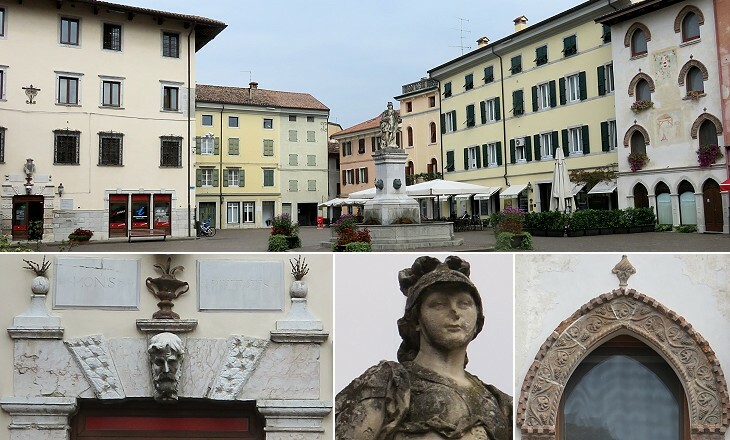 In 1553 Venice decided to appoint a Provveditore (governor) to rule Cividale and its small district, which until then were ruled by the Provveditore of Udine. A palace for the governors was built on the site of that of the Patriarchs. 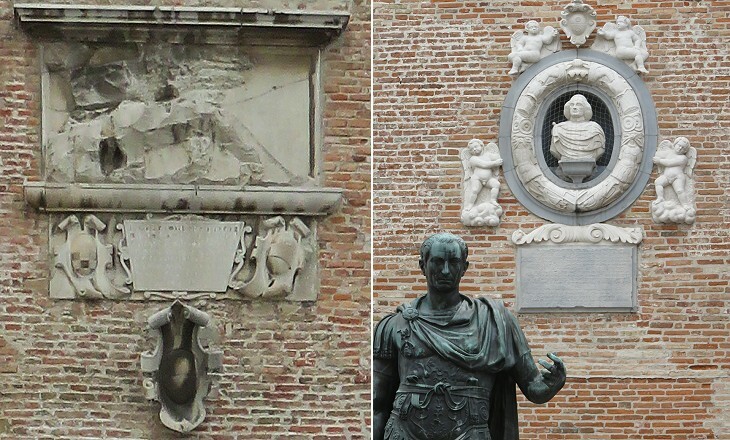 It was designed by Andrea Palladio and it was completed in 1596, but not entirely in line with the original project. 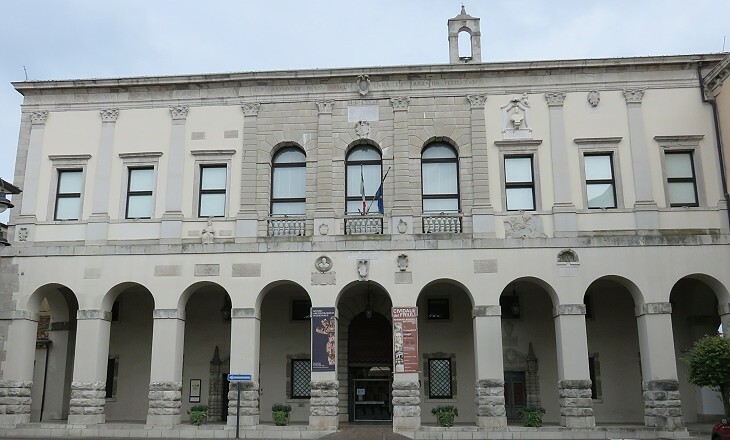 It now houses the National Archaeological Museum of Cividale. 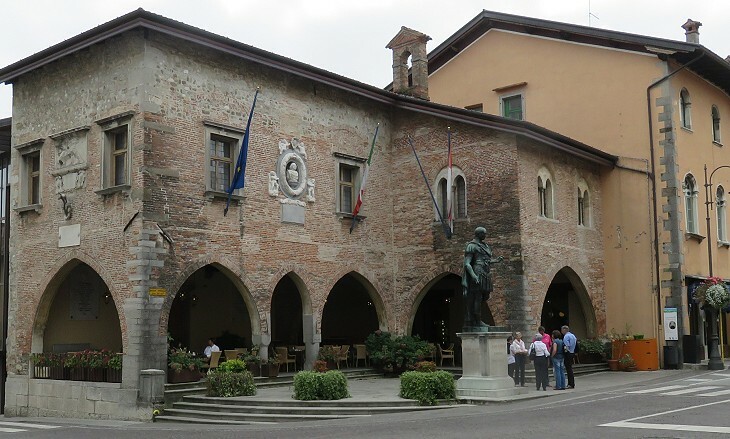 This complex of buildings is situated in the oldest part of the town and it includes Tempietto Longobardo, a small chapel which is covered in the first page. 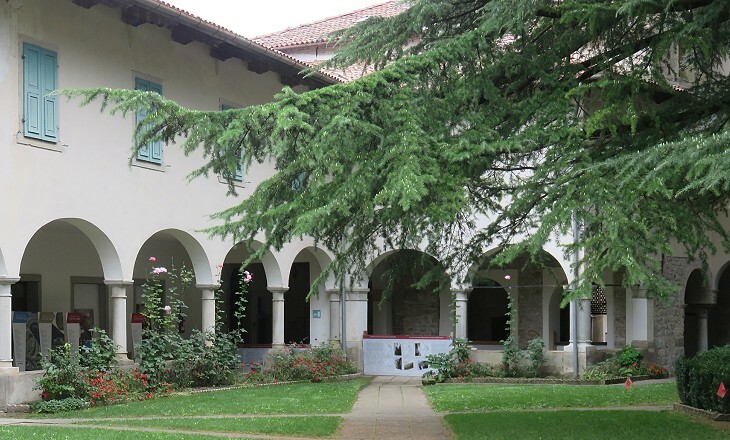 The cloister of the convent was rebuilt in 1431 and most likely enlarged in 1497. 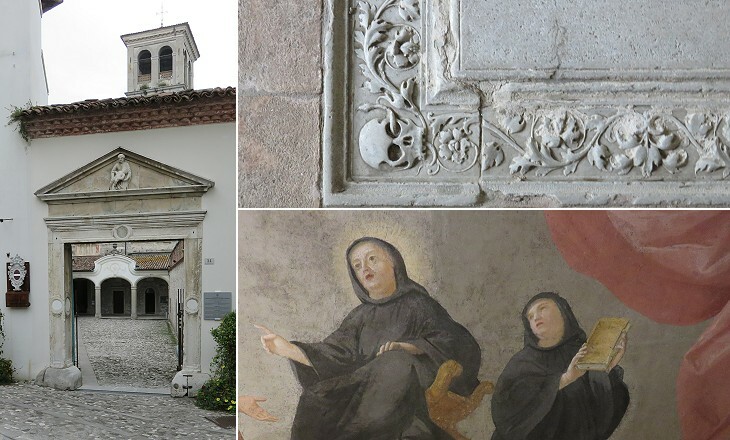 The convent could rely on substantial donations and revenues from its properties. In the early XVIIIth century it was enlarged and redesigned. Its abbesses belonged to very rich families and were keen on living in well designed and decorated premises. Cividale was badly affected by the poor relations between the Republic of Venice and the Archduchy of Austria during the XVIth century, which eventually led to the construction of a powerful Venetian fortress at Palmanova and to open war in 1615-17. This square houses a historical vegetable market. In 1874 a Longobard tomb was unearthed there (a golden cross found in the tomb is shown in the first page) and this finding led to believe that a nearby XIVth century building stood on the site of the house of Paolo Diacono, the author of Historia Langobardorum, an account of the events which occurred in Italy between the Longobard invasion of the country in 568 and the death of King Liutprand in 743. Paolo Diacono was born at or near Cividale and he died at Monte Cassino in ca 796. He wrote a hymn to St. John the Baptist; the initial syllables (ut, re, mi, fa, sol and la) of its first six verses were used by Guido d'Arezzo at Pomposa to develop his musical notation. The Republic of Venice collapsed in May 1797 and its mainland territories were occupied by French troops before being ceded to Austria in October of that same year. The defacements of the Winged Lions which occurred during the French rule were often due to local supporters of the 1789 Revolution. Some fine Winged Lions can be seen in the Venetian fortresses in Greece and on Cyprus, because the Ottomans did not care to destroy them. The image used as background for this page shows a 1436 relief at Porta S. Pietro, one of the gates of Cividale, which still retains some of its walls.